CosmoBC.com » LawBlog » Traffic Code » Driving Laws: How Are They Enforced? In recent reports, Highways England have highlighted the high level of dangerous driving across UK roads, with their latest campaign catching over 4,000 drivers committing driving offences. In light of this, the following is a list of figures and statistics covering various UK road laws, and how they are enforced, as researched by retailer of used vans, Van Monster. Rule 148: Drivers in England and Wales must not smoke or allow anyone to smoke when in an enclosed private vehicle should someone under 18 be on board. How well is the law being enforced? Dyfed-Powys Police revealed they had issued four verbal warnings. Metropolitan Police revealed they had issued two verbal warnings. Devon & Cornwall Police revealed they had issued one verbal warning. None of the 42 English and Welsh police forces had issued according to details of a Freedom of Information request on June 29th 2016. Rule 90: Any health condition likely to affect your driving must be reported to the Driver and Vehicle Licensing Agency (DVLA). A £1,000 fine or even prosecution. According to Direct Line Car Insurance, nearly three in ten motorists over the age of 65 years old have medical conditions such as diabetes, epilepsy, eye problems and heart troubles. However, almost half have failed to update the DVLA on these conditions. Furthermore, an estimated one in four motorists has a ‘notifiable condition’. However, one in ten have failed to keep the DVLA up to date about this. Rule 92: Those required to wear either glasses or contact lenses in order to read a vehicle number plate, in good daylight, from a distance of 20 metres (or 20.5 metres when an old style number plate is used) must wear them whenever they are driving. A £1,000 fine, three penalty points or a discretionary disqualification. A survey by One Poll involving 1,000 glasses wearers revealed that one in eight drivers who should be wearing glasses while driving admitted to being behind the wheel without them. Have a blood alcohol level of more than 80 milligrammes/100 millitres of blood. A fine of up to £2,500. A driving ban of at least one year (though this will rise to three years if convicted twice in ten years). A driving ban of at least two years. The requirement to undertake an extended driving test before your driver’s licence can be returned. 683,651 roadside breath tests were carried out by England and Wales police forces in 2013. 12 per cent of drivers or riders tested (71,675 of the 683,651) either failed or refused to take the test. A driving ban that will last for at least one year. A conviction for drug driving appearing on your driving licence for 11 years. The Institute of Advanced Motorists (IAM) released exclusive statistics following a Freedom of Information request regarding all England and Wales police forces revealed more than 400 drug drivers were arrested per month between March and May 2015. The Metropolitan Police made 214 arrests in the period covering March 2nd to May 11th — the highest number of drug-driving arrests recorded in the statistics. Northumbria Police made 97 arrests. Police forces in Cheshire made 70 arrests. Police forces in Sussex made 58 arrests. Police forces in South Yorkshire made 55 arrests. Rule 99: A seat belt must be worn in cars, vans and other goods vehicles where they are fitted. Furthermore, a seat belt or child restraint must be used by adults and children aged 14 years and over when seated in buses, coaches and minibuses, where they are fitted. Holders of medical exemption certificates. Anyone making deliveries or collections in goods vehicles where they travel less than 50 metres. A £100 on-the-spot fine or a maximum fine of £500 if prosecuted. According to the Department for Transport on February 25th 2015, 95.3 per cent of all drivers in England and Scotland were found to use seat belts during research carried out during a period in 2014. 94.6 per cent of all front seat passengers based in England and Scotland were using seat belts or child restraints. 90.3 per cent of all rear seat passengers based in England and Scotland were using seat belts or child restraints. 98.2 per cent of car drivers based in England and Scotland were using seat belts. 96.7 per cent of car front seat passengers based in England and Scotland were using seat belts or child restraints. 90.6 per cent of car rear seat passengers based in England and Scotland were using seat belts or child restraints. Rule 105: Signs used by school crossing patrols must be obeyed (as well as those provided by police officers, traffic officers and traffic wardens). Given three penalty points on your driving licence. One of the most concerning factors is that the number of school crossing patrols (more commonly known as lollipop people) is in decline. According to road safety charity Brake, the number of school crossing patrols has decreased by at least 992 between 2010 and 2014 alone. This is despite the fact that 36 per cent of children aged between five and ten years old walk to school, as well as 38 per cent of kids aged between 11 and 16 years old. 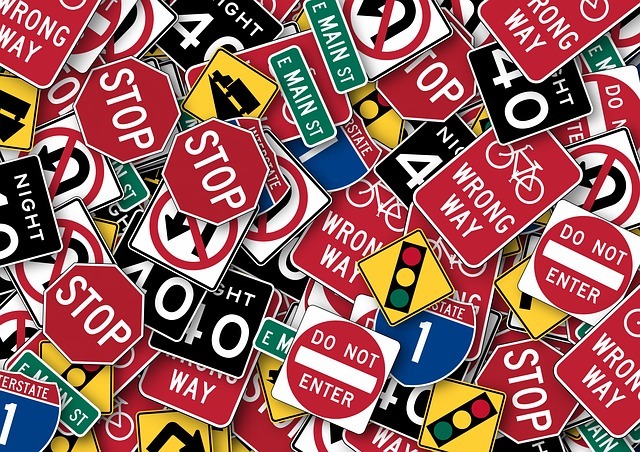 Rule 109: All traffic light signals and traffic signs giving orders must be obeyed — this includes temporary signals and signs. Three penalty points on your driving licence. *This speed limit is reduced to 60mph if the goods vehicle is articulated or towing a traler. Results from a Freedom of Information Act request to police forces across Britain, LV= car insurance found that each police force recorded an average of 56,080 speeding offences in 2015 – an eight per cent increase year-on-year when compared to 2014 (there were an average of 52,028 speeding offences recorded that year) and a rise of 20 per cent compared to 2013 (when an average of 46,905 speeding offences was recorded). Rule 141: Unless indicated to do so, you should never drive in a bus lane during its period of operation. The initial penalty for breaking this law is an issued fine of £60. This charge is reduced to £30 if payment is made within 14 days of the date of notice, though increased to £90 if a driver has failed to pay the charge within 28 days. Throughout 2014, councils issued at least £30 million in fines and an estimated one million penalties for bus lane infringements, according to a Freedom of Information request made by The Times. Rule 149: A hand-held mobile phone or similar device must not be used when driving or supervising a learner driver. The only exceptions to this rule is to call 999 or 112 in a genuine emergency when it is either impractical or unsafe to stop. An automatic fixed penalty is issued if caught using a mobile device when driving – a £100 fine and three penalty points will be applied to your driving licence. However, if the case goes to court then the maximum fine could be £1,000 and the offender could also be disqualified from driving. Furthermore, those driving goods vehicles or buses are faced with a maximum fine of £2,500. In 2014, around 1.6 per cent of the estimated 36 million drivers on the road in Britain (equivalent to more than 500,000 motorists) were spotted using a hand-held phone while driving, according to figures released by the UK government. This is an increase of the 1.4 per cent recorded when a similar exercise was conducted five years earlier. Van drivers — 2.7 per cent. Car drivers — 1.4 per cent. Lorry drivers — 1.2 per cent. Bus, coach and minibus drivers — 0.4 per cent. There are various rules related to parking a vehicle in the UK — see rules 238 to 252 of The Highway Code by clicking here for full details. Parking tickets or penalty charge notices are issued depending on the parking of the vehicle and who issues the charge. Generally, you will often have 28 days to pay the charge from the date it was issued, with the fine sometimes reduced by 50 per cent if settled within 14 days. The risk of receiving penalty points on your driving licence in relation to parking offences only applies to certain situations, such as when a vehicle has been left in a dangerous position. 355,519 tickets were issued in Westminster. 235,364 tickets were issued in Camden. 217,239 tickets were issued in Islington. 120,463 tickets were issued in Brighton and Hove alone. 276,324 tickets were issued in Greater Manchester alone. 233,816 tickets were issued either in Bristol, Plymouth of Bath. 93,540 tickets were issued in Leeds. 54,425 tickets were issued in Sheffield. 47,359 tickets were issued in Bradford. East England — 329,728 parking tickets issued. West Midlands — 308,498 parking tickets issued. East Midlands — 297,826 parking tickets issued. North East England — 188,251 parking tickets issued.